Whenever I have an opportunity to share a bit about my childhood, I grab it and beam with a smile. First of all, I love relieving the beautiful things that I experienced as a child (priceless, isn’t?) Secondly, some of these experiences immensely contributed to making me who I am today, and who I am still becoming. Therefore thanks for reading. Ripe plantain are naturally sweet. May also be referred to as yellow plantain. Most times you buy them "green," and allow them to ripe. Here I have just washed them as I get ready to use them. Growing up I was immersed in plantain. My parents had plenty plantain trees around the compound and on the farm. Click To Tweet This means that first hand I saw how plantains are planted, how they grow, bear fruits, and eventually harvested. Usually, we harvest plantains at their prime, sometimes with one or two already ripen while still on the tree. Plantain leaves also function the same way as banana leaves. It has several duties under its belt such as “moi-moi” wrapper, agidi wrapper, pot liners, snack wrappers, manure, and many others I can’t think of right now. There are several ways to make plantain frittata, but there is only one way to make it flawless, and perfect. And that is by making it your own way and adding your favorite veggies, and spices. My primary goal in today’s post is to show you how to make this healthy and hearty plantain frittata, and my second primary goal is to inspire you to make it your own perfect way. I mean isn’t that why we read/learn recipes so we can recreate them however you wish? Henceforth, your best flawless frittata starts in your kitchen. You know I have to dig in as soon as this came out of the oven. And it was so good, all the ingredients combined very well together for this recipe. A must try! You better believe it but this is my second (tasting) plate. I added fresh green bell peppers for additional crucnh. Plantain (well, of course); Plantains are high in vitamin A; a serving size plantain of plantain provides the body with almost about 40% of the daily recommendation of vitamin A. Plantains promote digestive health because they are high in fiber as well potassium and magnesium. Plantains help heal ulcers caused by aspirins. You can eat green (unripe) or yellow (ripe) plantain. Ripe or yellow plantains are sweet. Most plantain frittata recipes call for ripe plantain, and that's what I will be using. Eggs; is there ever frittata without eggs? Well, am yet to see, but will tons of amazing vegans recipes out there, I would say yes. Significantly eggs are high-quality protein and one of the most famous and stable foods in most households. Alongside plantain and eggs are onions, bell peppers, tomato, garlic, and any other vegetable you want. And some spices as well. It is important to realize that only you (or someone that knows you best) can make your perfect plantain and eggs frittata my dear friend, just you. Here are all the (filling) ingredients I used for today's plantain and eggs frittata. The Planatin is already fried and set aside. And if you are ready, let’s make it together. 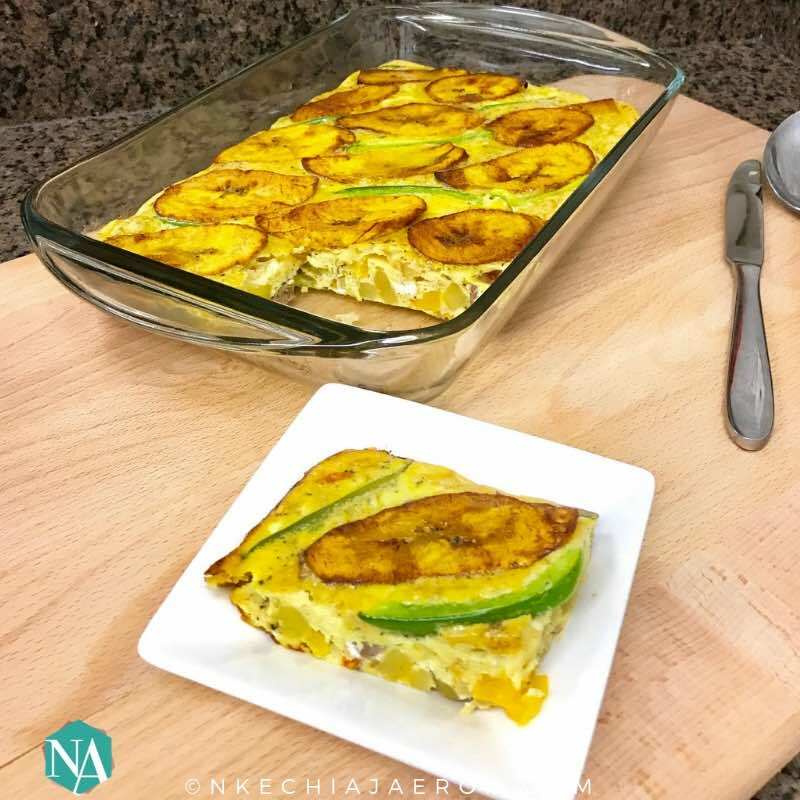 This plantain frittata and eggs is simply perfect! It is a great way to enjoy your favorite vegetables, and honestly, even a picker eater wouldn’t even notice. Serve it warm for either breakfast or dinner. Wash and cut all vegetables accordingly and set aside. Wash and cut potatoes into ½ inch sizes then precook in boiling for about 4 – 5 minutes (or until half cooked), drain the water and set aside. Set frying pan on the stove for the plantain. Slice plantain and season liberally with salt and start frying as soon as the oil is hot; also ensure that the oil is not too hot to prevent burning. Place on a paper towel as they come out of the oil; fry all the plantain and set aside. Grill sausage, and cut into tiny pieces, then set aside. Place a clean pan on the stove and add 1 – 1½ tablespoons of oil and allow to heat up then add a dash of salt and the cup of chopped onions and garlic. Cook for 2 – 3 minutes and add the tomatoes. Allow the tomatoes to cook with the onions for 2 minutes and add the bell peppers. After 1 – 2 minutes add the potatoes and keep stirring, then add all the ingredients (salt, seasoning cube/powder, black pepper, thyme, nutmeg, curry, crushed red pepper, and onion powder), mix well to combine if possible taste to ensure flavors are how you like them. Finally, stir in the sausage; give a good final stir and then turn off the stove. Allow the sautéed vegetables to cool (I would typically scoop into a bowl and place in the fridge when I am in a hurry). For the final step, turn the oven to 350 degrees. Then break all the 7 eggs in a big bowl add a little salt (or ¼ teaspoon), plus ½ seasoning powder and beat well to combine. Then gently stir in the already sautéed (and cooled) vegetable mixture; use a spatula or wooden spoon to mix. Pour the mixture into an already sprayed baking dish. Line the top of the frittata with the already fried ripe plantain. Bake for 25 – 30 minutes or until a toothpick inserted into the baking dish comes out clean. Serve with avocado, some fresh bell peppers (for crunchiness) or simply fresh apples. Enjoy! This recipe serves 4 – 5 people. If you/your family loves plantain feel free to use more one plantain for this very recipe. I only used one plantain because of the kids. They like it better with less plantain. Feel free to add some cheese if you wish. Do not be afraid to add the veggies that you love. Now it is your turn to share with me in the comment how you make your own frittata. Do you add cheese to them? As you can see I don’t. Is there a particular breakfast recipe you would want me to share? Noteworthy: Here in my kitchen we inspire each other to live our best healthy live without judgment and resentment. 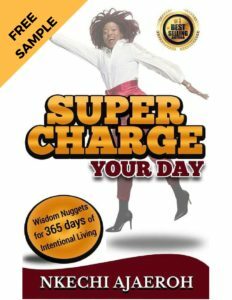 When you join me FREE, you will also get exclusive healthy tips and hacks! Be a part of my culinary journey as I cook up some of the recipes I ate growing up, plus plenty more I met along the way. And if you prefer light and lovely recipes, I got you!